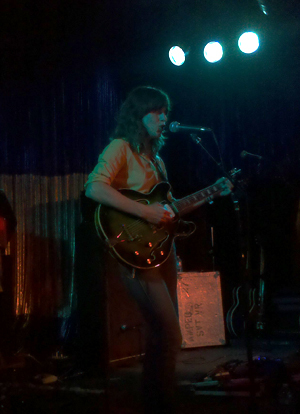 On some level, it ought to be criminal that Eleanor Friedberger, the Fiery Furnaces member and certifiable Indie Rock Celebrity, had to sell her own merch at the Satellite last night and suffer the further indignity of going on first, at 9, before an Australian band that’s never earned a Best New Music. At the very least, it should be criminal to not announce set times early enough for me not to miss 40 minutes of the Friedberger set, but such is life. In the handful of songs I caught, she played Last Summer standout “Early Earthquake” and some yet-to-be released numbers that were just as good, alone with an electric guitar and immaculate elocution. Given that she’s playing a pair of free in-stores today and tomorrow, maybe she prefers it this way; she seemed happy enough to huddle into a corner of the venue and preside over her t-shirts and CDs. Cloud Control, who followed, were a pretty convincing argument for nostalgia. The Australian act tapped into the ’00’s fascination with African rhythms, ’90s melodic sentimentality and ’80s guitar tones; at times, they sounded like the Smiths covering the Proclaimers. It was fantastic. One song offered two minutes of textbook C86 before diving into a gloriously wanky Dinosaur Jr. guitar solo, blinking, and jangling onward as if nothing had happened. It was funny without being embarrassing, the kind of moment that reminds you that rock music’s always better when it stops trying so hard to be Art.